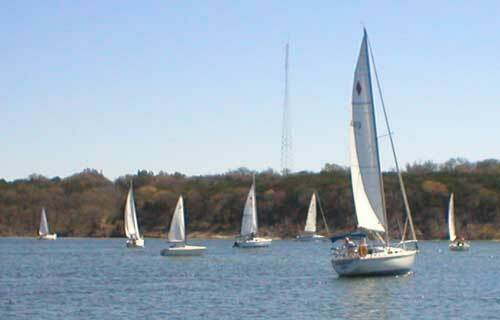 11 boats entered the 2005 Bridge Too Far race on March 12, 2005. This is an appoximately 22 mile race from the marina near the dam to the bridge about 11 miles upstream, and back. Times corrected by handicap, there was only 25 SECONDS between first and third place! This was my second year in this race, and both times the wind was blowing 20 to 30 and gusting above that! With temperatures in the 80's, it was T shirt and shorts weather. No one flipped this year so the water temp was no problem. Here the boats gather for the noon start, since the starting line is in a protected cove you can't see the large waves and whitecaps on the lake where we raced. Another pic before the race. We don't have any pictures from DURING the race, seems everyone had their hands full! My camera soon found it's way to the water in the bilge and popped open releasing the batteries, but it was so windy I couldn't take my hands off the tiller and mainsheet to take pictures anyway. I didn't flip, but came close too many times. Looks nice and calm here in the cove, but out on the lake it was a different story. 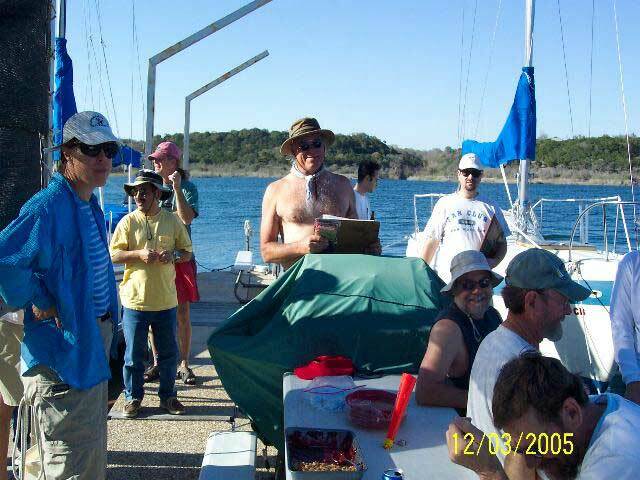 This picture and all the rest are courtesy of Bill of the Stillhouse Hollow Sailing Club. I think this is B.J. Cummings in his Catalina 22 before the race. 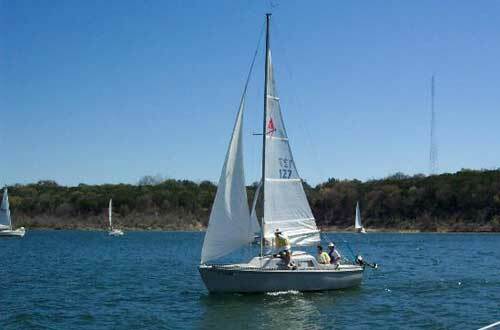 Looks like Rey Garza pointing, he flipped his Mutineer 4 times last year so decided to crew on a more stable boat this year. Wise decision, it was hairy out there. Right after the start I noticed I had lost two of my four battens, the wind just stripped them out. 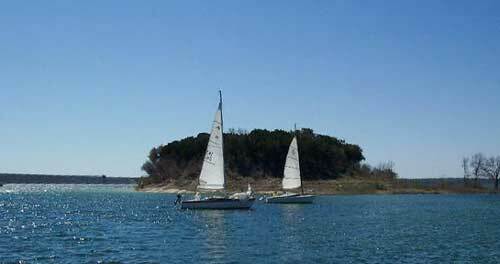 The closer boat on the right is Steve Wesson in his Freedom 21, notice the reefed main. 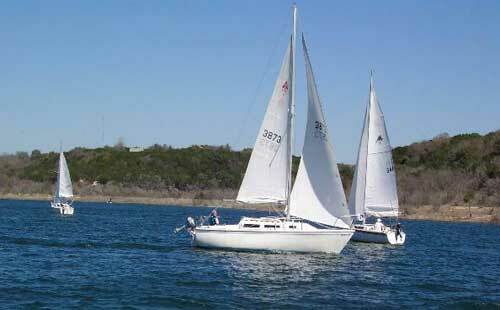 Several of the boats wisely reefed their mains before the start. Even then, I saw boats spinning out in the gusts all day. I had to release my main and pull it back in so many times my arms were very sore the next day. Here's Rick Powers in his Merit 25 and Steve in his Freedom 21, both smart enough to reef their mains before the race started. 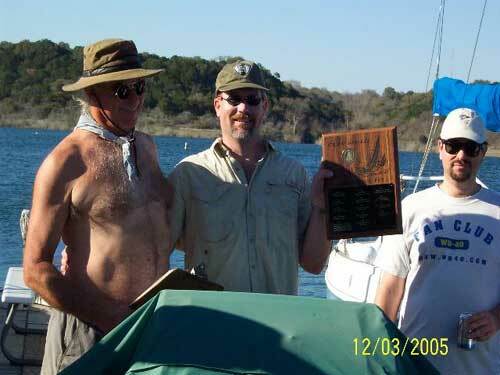 Steve presents the trophy to Jim Brown, who has been trying to win this race in his J/24 for years. In true racing spirit, he flew his spinnaker most of the way back from the bridge, and that was enough to beat Abe Racine by only 5 seconds! Notice how well Steve can hold his belly in for the pictures. 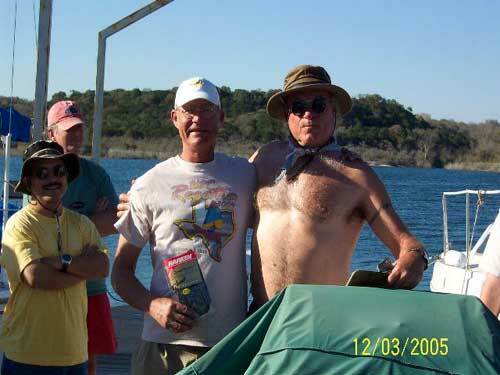 Steve gives David Luckenbach a pair of Harken sailing gloves for finishing first of the non club members (third overall and only 15 seconds behind Jim), which David said would have prevented a few blisters if he'd had them for the race. David couldn't have done it without his crew, Jody Gayle, in the red hat. After the race, participants enjoyed a delicious cherry cobler on the dock.